So you’ve been invited to a masquerade party. Even better, you decided to host one. Good for you. Now it’s time to make the most important decision you’ll ever make for this event – which masquerade mask should you wear. Because, let’s face it, your mask will set the tone of your evening. And because of that, you definitely want to get the best masquerade mask you can afford. Fortunately, what makes a mask the best is very relative. It will depend on your needs and preferences. If you don’t want to check out each and every mask being offered online, you’re in luck. We’ve made it our business to dig through the layers of masks in the market to create a list of the best you’ll ever find. Tip 2: Stick, ribbon, or elastic? Tip 3: How much face do you want to be covered? This may look like an incredibly delicate mask but don’t let its look fool you. It’s made out of 100% metal fiber and decorated with rhinestones. It comes in one size but it’s so flexible that you can adjust it to fit your face. Yes, you need to be gentle when bending the mask but it’s not going to snap easily. In addition, it comes in various colors so you can find one that matches your costume perfectly! And all for $18! Our second pick is another one from Luxury Mask. This mask, as you may have noticed, has a lot of ornamental work going on. But it’s definitely not too ornate if you get what we mean. Made out of metal fiber, you can gently adjust the mask to fit your face. Like our number one pick, this also comes in a variety of colors and patterns to suit almost every costume. Wearing this mask will ensure you’re the talk of the ball. This masquerade mask from Coxeer is made out of metal and plastic. It’s a half face mask, covering your eyes along with your nose. The metal is bendable so you can easily adjust it to your face shape. And while there are quite a lot of details that decorate the mask, none of it will poke your face. In addition, the mask feels pretty sturdy and yet sits comfortably on your face for hours. If you’re going to a traditional masquerade ball, then you might be interested in going there as the female version of the Phantom. It comes with satin ribbons and features intricate glitter, rhinestones, and is offered in various patterns and colors. The design is definitely one of a kind. And while there are some complaints about the uncomfortable fit, looking good comes at a cost, right? Unlike a lot of the other masks, you’ll see on this list, this one doesn’t have intricate metal scrolls and elaborate filigree or feathers. But that doesn’t mean that the Colombina Heartbreaker Gold is lackluster. It features a lot of shimmer and sparkle – specifically glitter-gold decorations on a black Colombina mask. Handmade in Italy, its simplicity is definitely part of its beauty. Plus, there’s the added bonus of not having any of the metalwork “stabbing” you in the face. Two black ties secure the mask to your face. This crown mask is made out of a lightweight eco-friendly metal alloy that will easily bend the way you want it to without breaking. You can definitely create a perfect fit. As for the decor, the picture speaks for itself. The mask features an intricate design with some rhinestones decorating above the eyebrow and along the center of the mask. This Venetian mask is perfect for those who want something asymmetrical and unique. The intricate design of the mask is definitely eye-catching and the addition of the crystals enhances the overall look. While there are only 4 colors to choose from, they are all neutral colors that will fit most costumes. The mask only comes in one size but it can be bent to fit across various face shapes. It does require a bit of time to do this but all good things do anyway. This half face mask is contructed out of thick resin with a metal butterfly and filigree decoration on top. Half of the mask is light blue while the other half is white with blue glitter decor on top. And you can easily tie the mask around your face using the satin ribbons attached. The mask is adjustable, similar to our other picks, however it can be a bit heavy, particularly on the side where the butterfly is attached. Want something totally different? This deluxe half mask is made out of 100% polyester with a dark green velvet surface, peacock and purple feathers, and a gold trim. 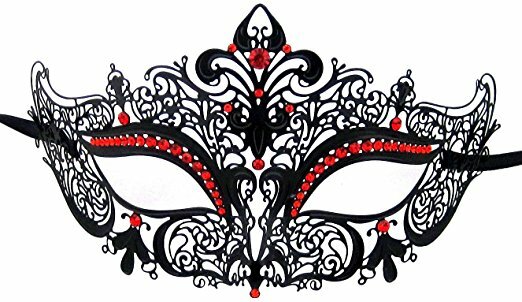 Aside from its unique look that works well at masquerade balls and Mardi Gras parties, the mask comes with a headband instead of ribbons or an elastic band. If you tire of wearing the mask, you can just flip it up and wear it like shades. Love Fifty Shades of Grey? You can wear a mask exactly like Ana’s in the movie at your next masquerade ball. This silver grey mask is shaped like a Burano Venetian lace mask and made out of cloth. The crystals are not included but can easily be attached if you wish to make your mask more like the one in the movies. Aside from being reminiscent of the movie, the mask is quite comfortable to wear and can easily be tied on. This Coxeer mask is made out of high-quality plastic with two layers of metal scroll works on top along with shiny crystals to create an elegant design that would complement perfectly with any masquerade costume. The details are beautifully done. The mask comes slightly molded, like any traditional Venetian mask, so it can be a bit difficult to conform to your face. Unlike other masks in our line-up, this one comes with a stick – perfect for those who prefer to keep the mask off their face most of the time. Who doesn’t love playing dress up? No matter what age you get, putting on a costume for a party has an unending appeal. That goes double for masquerade balls. Not only are you dressing up for the ball, but you also get to wear those lovely intricate masks for a night of naughty fun. While there’s absolutely no need to convince you why you should wear a mask at a masquerade ball, you might wonder how to go about choosing one that’ll compliment you and your costume to a T. This is where our guide comes in. We’ve got some tips that will help you pick out the best masquerade mask. Before you even think about which mask looks lovely, you need to first make sure you chose the correct costume. Some masquerade balls follow the traditional style which is more in line with Phantom of the Opera than Mardi Gras. This means that you’ll need to be in period costume (i.e. traditional Venetian ball gown) and your mask will need to match it. Think elaborate feathered masks and long-nosed theatrical masks. Other masquerade balls are more modernly styled which means you can get away with just about any formal wear. And your mask will be no different. You can choose a plain black one to something incredibly glamorous. Do you plan to wear your mask the entire night? Then you might want to consider one that can be tied on, leaving your hands free to roam wherever they please. You get the added benefit of remaining anonymous the entire night should you wish it. A ribbon will allow you to tie your mask as loose or as tight as you want to, giving your ‘do a bit of breathing space. An elastic band, on the other hand, will make it so much easier for you to wear your mask, no adjustments needed. But if you wear glasses, don’t like the weight of a mask on your face, don’t want the mask ruining your makeup, and/or you simply don’t plan on wearing the mask all night, you can choose a handheld mask instead like the Coxeer Princess Venetian Mask. Just keep in mind that you may lose it as you let loose at the party. There are three kinds of masks – a full face mask, a half face mask, and an eye mask. Obviously, the full face mask covers your entire face, the half face covers the upper half of your face (i.e. eyes and nose), and the eye mask covers only your eyes. Full face masks offer total anonymity but it also makes eating and drinking difficult. Traditional Venetian masks are usually half masks like the Masquerade Mask Shiny Metal Rhinestone Venetian Pretty Party Evening Prom Mask. Take note that while you might prefer a certain amount of coverage, you may need to reconsider. Some types of masks are a better fit for certain face shape and size. But more on that later. Ok, we already mentioned that you should consider your costume when choosing a mask. Well, that was more choosing which range of masks is more appropriate for your masquerade party – traditional or free-for-all. In the case of color and other features of your mask, your choice will also depend on the color and “features” of your gown. You need to choose a color that doesn’t clash with your gown. The pattern (if there is one) needs to complement your outfit as well. Gold, black, white, silver, and cream-colored masks usually go well with a variety of different colored dresses. Bolder colors such as red or pink will have to be paired more carefully. As for the extra embellishments, a dress/gown that is already quite elaborate may not pair well with a mask that is equally glamorous. Then again, you may want to choose a mask that has the same “decor.” For example, if your gown is decorated with glitter, then you might want to get a mask that has glitter as well. We mentioned earlier that your face shape and size will affect the type of mask that would fit you well. A petite face, for example, would look great with a petite eye mask. But a person with a wider face, particularly around the eyes, will have to opt for a wider mask or at least one that is made of flexible material such as paper mache or lace. We recommend trying out a mask before buying it so you’re certain that it fits well. Whichever masquerade mask you finally choose for your next ball, you need to keep in mind one thing – what happens behind the mask, stays behind the mask. Aight?